Speed Queen top load washers are designed, tested and built to deliver 25 years of commercial-grade performance in your home. 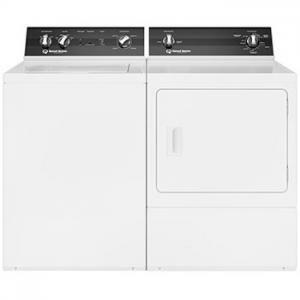 In fact, the Speed Queen top load washers that you put in your home are the same durable, long-lasting washing machines used in laundromats and other commercial applications, like hotels and military bases. Constructed with metal components where others use plastic and rigorously tested to ensure reliable performance, Speed Queen top load washers are built better to last longer. Speed Queen dryers are designed, tested and built to deliver 25 years of commercial-grade performance in your home. In fact, the Speed Queen dryers that you put in your home are the same durable, long-lasting machines used in laundromats and other commercial applications, like hotels and military bases. Built using premium materials and rigorously tested to ensure reliable performance, there’s no question why Speed Queen is considered one of the industry’s top dryers.